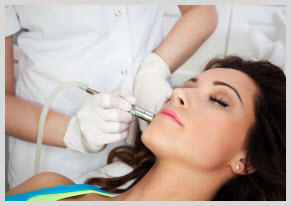 The Microdermabrasion facial is a safe, controlled treatment that intensely exfoliates and resurfaces the skin. A fine jet of abrasive crystals gently removes dead skin cells layer by layer and a vacuum action lifts away the debris, stimulating the blood flow and encouraging collagen and elastin formation that results in firmer, revitalised and youthful looking skin. Wrinkles disappear, acne scarring and blackheads are reduced, dull and tired skin is completely banished – sometimes after just one treatment. Microdermabrasion has made the cross over from Hollywood and is referred to as an “instant facelift” in some circles. It is an effective alternative to expensive and more invasive procedures such as cosmetic surgery and Botox. Recently, more and more men are trying it, instead of pursuing cosmetic surgery. Intense exfoliation and resurfacing to rejuvenate the skin. Treats ageing skin, lines, blemishes, uneven skin tone, blackheads and open pores. When Do Microdermabrasion Results Become Visible? That depends on your skin and the micro dermabrasion machine used by your practitioner. Some patients reported changes after the first treatment. Your skin will look cleaner and healthier after a few microdermabrasions, but major changes (like reduction of wrinkles and scars) become visible after five treatments. You should wear a sunscreen hydrating moisturizer after microdermabrasion, to avoid sun damage. Some redness might occur on treated areas, but they generally disappear after a few hours. During the first 24 hours, your skin may feel dry, similarly to effects of a mild wind or sunburn. Use lots of moisturizer during the first few days (without acids), avoid sun exposure for at least a week after the treatment, don’t use any peeling products for the next 3-4 days and avoid full-face make up (liquid foundation or pressed powder). Are There Any Microdermabrasion Contraindications? Microdermabrasion is not recommended to keratosis sufferers, people with undiagnosed lesions, active rosacea or acne, weeping acne (stages 3 to 4) Recent laser surgery or Accutane acne treatment may also be sound reasons for your practitioner not to recommend microdermabrasion. Discuss your medical history to your practitioner if unsure. Microdermabrasion is virtually risk-free. It is non-invasive and mild, so you have nothing to worry about. At Avant Aesthetics the risk of infection is zero as all parts in contact with the patients skin are disposed of after the treatments.